Pour gelatin with 2 tbsp of cold water, put aside for 10 min. Add in curd banana puree (from 1 banana) and sugar powder, mix well with blender. Heat gelatin on water bath, let it cool, pour in curd mass and stir, put in fridge for 1-1.5 hour. Once the mass gelled, mix it again with a mixer at high speed in foam. On the bottom of bowl put some diced banana and ground cookies, top with curd-banana mass. Remove mass in fridge again, for freezeng. Before serving sprinkle with ground cookies and grated chocolate if you wish (I sprinkled with grated candy). 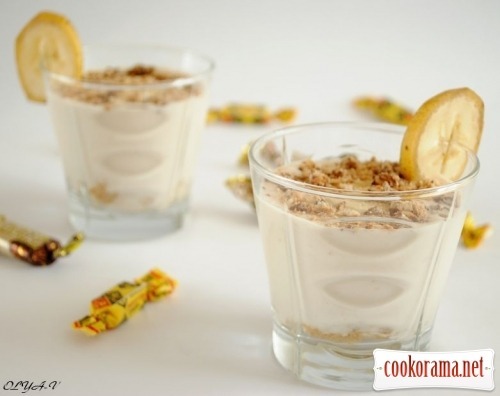 Top of recipe "Curd-banana dessert"
Хороший рецепт и замечательные фото!